To Cite: Farajzadeh Sheikh A, Rostami S, Jolodar A, Tabatabaiefar M A, Khorvash F, et al. Detection of Metallo-Beta Lactamases Among Carbapenem-Resistant Pseudomonas aeruginosa, Jundishapur J Microbiol. 2014 ; 7(11):e12289. doi: 10.5812/jjm.12289. Background: Carbapenems are important drugs used for the treatment of Pseudomonas aeruginosa infections, however metallo-β-lactamases (MBL) are able to efficiently hydrolyze these classes of drugs. Immediate detection of the MBL-producing P. aeruginosa is necessary in order to accurately treat infections caused by this organism. Objectives: To determine the prevalence of MBL producing P. aeruginosa in burn and non-burn patients by two phenotypic tests and polymerase chain reaction (PCR) and to compare phenotypic tests with PCR. Materials and Methods: A total of 223 non-duplicate strains of P. aeruginosa were collected from three teaching hospitals of Ahvaz, Iran. Antimicrobial susceptibility and minimum inhibitory concentrations (MICs) of carbapenems (imipenem, meropenem, doripenem and ertapenem) were determined by the Kirby-Bauer and E-test methods. Combined disk (CD) test, MBL E-test and PCR were performed for carbapenem-resistant P. aeruginosa isolates. Results: Amongst all the P. aeruginosa isolates, 58.7% were resistant to imipenem while 31.8%, 13.5% and 74.4% were resistant to meropenem, doripenem and ertapenem, respectively. Amongst all the P. aeruginosa isolates, 44.4% were multidrug resistant and 13.45% were resistant to all of the carbapenems. The CD test with doripenem disk / 750 μg ethylene diamine tetra acetic acid (EDTA) had the highest efficiency compared to the other phenotypic tests. blaIMP and blaVIM genes were detected in 11.7% and 0.4% of isolates, respectively. blaSPM and blaNDM genes were not observed. Conclusions: Epidemiological and regional evaluation of MBL-producing P. aeruginosa through simple and inexpensive methods should be considered for effective treatment of carbapenem-resistant P.aeruginosa infections. Pseudomonas aeruginosa is an opportunistic pathogen that is able to survive in moist environments. P. aeruginosa is one of the causative agents of hospital-acquired infections, especially in burn patients, which is not only due to its high prevalence and severity but also because of its innate and acquired resistance to antibacterial drugs (1). Carbapenems (imipenem, meropenem, doripenem and ertapenem) are classified as β-lactam antibiotics. This class of antibiotics has a broad spectrum of activity and is the drug of choice for treatment of serious infections caused by P. aeruginosa. These antibiotics are relatively stable to hydrolysis by most β-lactamases (2, 3) but metallo-β-lactamases (MBL), which belong to class B of the structural classification of β-lactamases, are able to efficiently hydrolyze all β-lactams with the exception of monobactames (4-6). These enzymes require divalent cations, usually zinc, as metal cofactors for enzyme activity and are inhibited by metal chelators such as ethylenediamine tetra acetic acid (EDTA) (7). Furthermore, MBLs are encoded either by genes that are part of the bacterial chromosome in some bacteria or by heterologous genes acquired by transfer of mobile genetic elements. Therefore, acquired MBL can be spread among various strains of bacteria such as P.aeruginosa. Approximately nine different types of acquired MBL have been defined. The most important types that contribute to epidemiological and clinical studies are the IMP-type, VIM-type, SPM-type and NDM-type enzymes (8). Immediate detection of MBL-producing P. aeruginosa is important to prevent the spread of the organism within and between hospitals, and to accurately treatment infections caused by this bacterium. Various methods have been suggested for the screening of MBL-producing P.aeruginosa including phenotypic and molecular techniques (9). Phenotypic methods are based on the ability of metal chelators such as EDTA to inhibit the enzyme activity. These tests include double disk synergy test (DDST), combined disk (CD) assay, the Hodge test and E test (10, 11). None of these methods alone can recognize all MBLs; this is probably due to the variability of these enzymes (12). Molecular techniques including PCR, DNA probes, cloning and sequencing are more sensitive and specific for detection of MBLs, but they are not routinely available in most clinical laboratories and are technically difficult (9, 12). Due to the importance of rapid and precise detection of MBLs, in this study we examined the molecular epidemiology of carbapenem-resistant P. aeruginosa isolates in the burn and non-burn patients by the PCR method and detected MBLs by two phenotypic tests, including CD and E test and compared the phenotypic test results with that of the PCR method. This investigation was approved by the Ethics committee of the Ahvaz Jundishapur University of Medical Sciences. During the period from June 2011 to May 2012, a total of 226 non-duplicate Pseudomonas sp. isolates, were collected from teaching hospitals’ microbiology laboratories (two general and one burn hospital) in Ahvaz, located in the South west of Iran. 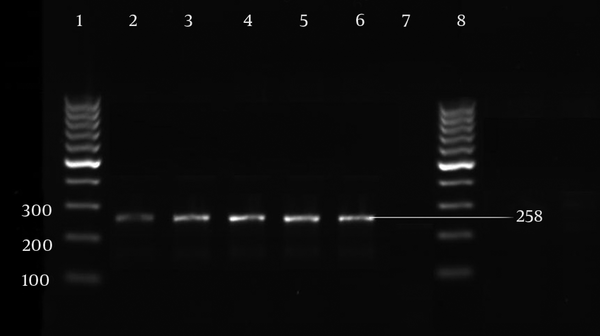 Identification of P.aeruginosa was done using previously described standard phenotypic tests (13), and verified by PCR amplification with specific primers for P.aeruginosa gyrB gene (primer sequence: gyrB-F: 5'- CCTGACCATCCGTCGCCACAAC-3', gyrB-R: 5'-CGCAGCAGGATGCCGACGCC-3' with product size 222bp) (14). Antibiotic susceptibility testing for all the collected samples was done by the Kirby-Bauer method as recommended by the Clinical and Laboratory Standards Institute (CLSI; 2011) (15). The following antibiotics were tested: imipenem (10 μg), meropenem (10 μg), doripenem (10 μg), ertapenem (10 μg), ceftazidime (30 μg), cefepime (30 μg), piperacillin (100 μg), piperacillin/tazobactam (100/10 μg), gentamicin (10 μg), amikacin (30 μg), tobramycin (10 μg), ciprofloxacin (5 μg), aztreonam (30 μg), polymyxin B (300 units), colistin (10μg) (Mast Group Ltd, UK). When the isolate was resistant to three or more classes of antipseudomonal agents (i.e. penicillins/cephalosporins, carbapenems, aminoglycosides and fluoroquinolones), that isolate was considered as multidrug resistant (MDR). If more than one agent within a class were used, the isolate was considered resistant to all of the agents (16). The minimum inhibitory concentrations (MICs) of carbapenems (imipenem [IMI], meropenem [MRP], doripenem [DOR], and ertapenem [ETP]) were obtained by the E-test (Liofilchem, Italy) as described by the manufacturer’s instructions. Susceptibility and MICs breakpoints were defined according to CLSI (15) except for doripenem and ertapenem which were referred to the criteria for imipenem and meropenem because they were not determined by the CLSI. Carbapenem resistance was determined based on the MIC breakpoints. P.aeruginosa PTCC 1430 (ATCC 27853) and Escherichia coli PTCC 1399 (ATCC 25922) were used as control strains in all susceptibility assays. For the CD assay, as previously described (11, 17), a bacterial suspension equivalent to 0.5 McFarland was inoculated onto a Muller-Hinton’s (MH) agar (Merck, Germany) plate. Two 10 μg disks of each carbapenem (IMI, MEM, DOR and ETP) were initially placed on the MH plates and 10 μL of MBL inhibitor solution (0.5 M EDTA) was added to one of them to obtain the 750 μg concentration. After a 24 hour incubation period at 35°C, inhibition zone diameter of each disk was measured and compared with each other. If the difference of inhibition zone between carbapenem disk and carbapenem-EDTA disk was ≥ 7mm, the isolate was considered as a MBL-producer (17). MBL E-test (imipenem (IMI) [4-256 μg/mL] and imipenem/EDTA (IMD) [1-64 μg/mL]) (Liofilchem, Italy) was performed according to the manufacturer’s recommendations. Briefly, the strips were placed onto MH plates that had been inoculated with a bacterial suspension equivalent to 0.5 McFarland and incubated at 35°C. The test was considered positive when the IMI/IMD ratio was ≥ 8 μg/mL. Polymerase chain reaction (PCR) analysis was performed for blaIMP, blaVIM, blaSPM and blaNDM genes. For blaSPM and blaNDM genes, the primers used were those previously described by Poirel et al. (18) (SPM-F: 5'-AAAATCTGGGTACGCAAACG-3', SPM-R: 5'- CATTATCCGCTGGAACAGG-3' with product size of 271 bp and annealing temperature at 59 ºC) (NDM-F: 5'-GGTTTGGCGATCTGGTTTTC, NDM-R: CGGAATGGCTCATCACGATC-3' with product size of 621 bp and annealing temperature at 52 ºC) and newly primers designed were used for blaIMP and blaVIM genes (VIM-F: 5'- GGTCTCATTGTCCGTGATGGTG-3', VIM-R: 5'-GGAATCTCGCTCCCCTCTACCT-3' with product size of 242 bp and annealing temperature at 60ºC) (IMP-F: 5'-TCCCCACGTATGCATCTGAATTAAC-3', IMP-R: 5'-CGGACTTTGGCCAAGCTTCTATATT-3' with product size of 258 bp and annealing temperature at 61ºC). DNA was extracted using the boiling method. Briefly, frozen bacteria were sub cultured onto Mueller–Hinton’s agar (Merck, Germany) before DNA extraction. One to five bacterial colonies were suspended in 500 μL of 1X Tris-EDTA buffer and heated at 95°C for 10 minutes and placed at room temperature for 5 minutes. The suspension was then placed at -20°C for 10 minutes and after centrifugation at 14,000 rpm for 10 minutes at 4°C, 2 μL of supernatant was used as the template for a 50 μL PCR reaction. The master mixture for detection of all genes consisted of: 5 μL of 10X reaction buffer, 2 μL of 50 mM MgCl2, 1 μL of 2.5 mM dNTPs, 2 μL of each 20 pmol/μL primer, 0.4 μL Taq polymerase 5 U/μL and 35.6 μL distilled water. DNA was amplified in a Mastercycler Eppendorf (Eppendorf, Germany) under the following conditions: initial denaturation for 3 minutes at 94°C followed by 35 cycles at 94°C for 45 seconds, at specific annealing temperature for 45 seconds, then at 72°C for 45 seconds. A final extension was performed for 5 minutes at 72°C and PCR products were kept at 4°C. 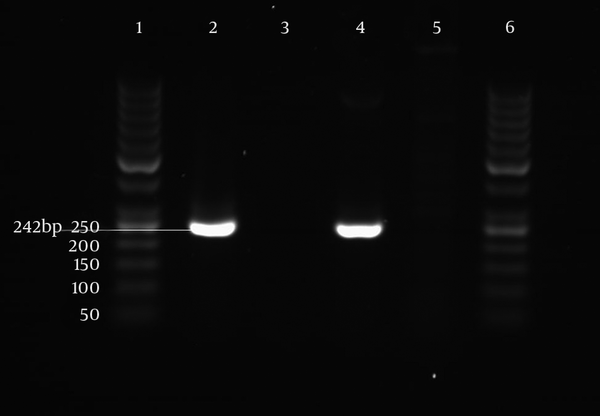 Amplicons were electrophoresed on a 1.5 % agarose gel with 0.5 μg/mL ethidium bromide in 1X Tris Borate EDTA buffer. Gels were visualized and photographed under ultraviolet illumination (primers were obtained from TAG Copenhagen A/S, Denmark and all chemical materials from CinnaGen, Iran). P.aeruginosa PTCC 1430 (ATCC 27853) reference strain was used as the blaMBL gene’s negative control strain. The results were analyzed using the Epi Info 7 (CDC, USA) software for Windows. Cross tabulation was done and sensitivity (SN), specificity (SP), and positive (PPV) and negative predictive values (NPV) of phenotypic tests were calculated for carbapenem resistant isolates against blaMBL genes; PCR was the gold standard. From 226 Pseudomonas spp isolates, 223 isolates of P.aeruginosa that had been verified using PCR of the gyrB gene were enrolled in the study. The sources of P.aeruginosa clinical isolates according to specimens and wards are shown in Table 1. Among these isolates 131 (58.7%) were resistant to imipenem, 71 (31.8%) to meropenem, 30 (13.5%) to doripenem and 166 (74.4%) to ertapenem, according to the Kirby-Bauer method. Susceptibility tests of other antimicrobial agents are summarized in Table 2. Among all the P.aeruginosa isolates, 99 (44.4%) were MDR from of which 77 (34.5%) and 22 (9.9%) isolates were observed in burn patients and non-burn patients, respectively. Overall, 30 (13.45%) isolates were resistant to all of the carbapenems (IMP MIC ≥ 258 and MRP, DOR and ETP MIC ≥ 32) and 169 (75.8%) isolates were resistant to carbapenems (imipenem and/or meropenem and/or doripenem and/or ertapenem). The MICs of carbapenems were determined by the E-test and the results are shown in Table 3. Among the 169 carbapenem resistant isolates, we found that 102 (60.4%) isolates exhibited ≥ 7 mm zone diameters by IMI disk/750µg EDTA, 81 (47.9%) isolates by MEM disk/750µg EDTA, 78 (46.2%) isolates by DOR disk/750µg EDTA and 132 (78.1%) isolates by ERT disk/750 µg EDTA. All of the imipenem-resistant isolates were MBL E-test positive, except one isolate that showed IMI/IMD ratio ≤ 8 μg/mL (2.6 μg/mL) and five intermediate imipenem resistant isolates were MBL E-test positive. Also, all the imipenem susceptible isolates were MBL E-test negative. Amongst carbapenem resistant isolates, 134 (79.3%) isolates were MBL E-test positive. The results of SN, SP, PVP and PVN of phenotypic methods of carbapenem resistant isolates are shown in Table 4. PCR analysis was performed for all the P.aeruginosa isolates. blaIMP and blaVIM genes were detected in 26 (11.7%) and 1 (0.4%) of the isolates, respectively, all of which were carbapenem-resistant (Figure 1 and Figure 2) . blaSPM and blaNDM genes were not detected. Combined disk test and MBL E-test were positive for isolates that harbored blaIMP and blaVIM genes and all of them were MDR. Amplified products of blaIMP and blaVIM genes underwent bidirectional sequencing using the ABI 3730 XL DNA analyzer (Applied Biosystems, USA). Sequences were compared to those of the blaIMP and blaVIM genes by using the information of the BLAST program from the National Center for Biotechnology (www.ncbi.nlm.nih.gov/BLAST/). Multiple sequence alignments were performed with the MEGA software (version 4). The sequencing of the PCR products confirmed the presence of a deference with other blaIMP sequences registered in GeneBank, in one of the blaIMP genes positive isolates (PA111) (accession no. HF584753). This isolate was recovered from a burn wound. In addition to its high level of resistance to carbapenems, this isolate showed resistance to other tested antibiotics tested (except colistin and polymyxin B). a N: number of isolates, %: percentage. a Abbrevitions: SN, Sensitivity; SP; Specificity, PPV; Positive predictive values; NPV; Negative predictive values. Lanes 1 and 8: 100 bp DNA ladder. Lanes 2-5: isolates with blaIMP gene in 258 bp. Lane 6: positive control (Clinical P. aeruginosa with sequenced blaIMP gene). Lane 7: negative control (distilled water). Lanes 1 and 6: 50 bp DNA ladder. Lane 2: isolate with blaVIM gene in 242 bp. Lane 3: isolate that is negative for blaVIM. Lane 4: positive control (clinical P.aeruginosa with sequenced blaVIM gene). Lane 5: negative control (distilled water). Antibiotic resistance among gram-negative pathogens such as P. aeruginosa is one of the major problems in treating hospitalized patients. In P. aeruginosa, multiple mechanisms are involved in β-lactam resistance, one of which is MBL production. Metallo-β-lactamases are able to degenerate carbapenems. Imipenem and meropenem are used routinely for the treatment of nosocomial infections but increasing resistance to these antibiotics, has limited their effectiveness. In our country, doripenem and ertapenem are rarely used, but imipenem and meropenem are being commonly used. During the recent years, the rate of imipenem resistance has been reported to be between 11% to 61% in Iran (3, 19-23) and 12.9% to 38% (24-28) in other parts of the world. In the present study, imipenem resistance was 57.8%, which was within the range of Iranian studies but more than other countries. In addition, we evaluated other carbapenems. As expected, high resistance to ertapenem was seen (74.4%); however, 43 (19.3%) isolates were ertapenem susceptible. Even though doripenem is not used in our country, the rate of resistance to this antibiotic was relatively high (13.5%), but interestingly, doripenem resistant isolates were mostly MBL-producers (27/29). Doripenem activity correlates with that of meropenem, where both have higher affinity for penicillin binding protein (PBP) 2, PBP3 and PBP4 compared to other PBPs in P. aeruginosa. This affinity profile differs from that of imipenem (29). In this study, after doripenem, colistin and polymyxin B, meropenem was the most effective antibiotic against P.aeruginosa and it can be said that the use of this antipseudomonal drug is more suitable for treatment of P.aeruginosa infections. Multiple phenotypic tests are used for the detection of MBL-producing P. aeruginosa; in this study we used two of these tests. The sensitivities obtained for the CD test with IMI, MEM and DOR disk/750 μg EDTA and MBL E-test were 100%, yet the result for the CD test with the ERT disk/750μg EDTA was less than other carbapenems. Also, the specificity of the CD test with all of the carbapenems and the MBL E-test were low. Qu et al. reported 100% SN, SP, PVP and PVN for CD assay with IMI disk/750 μg EDTA and 85.7%, 100%, 100% and 98.8% for the MBL E-test, respectively (11). Moreover, Pitout et al. reported 96% and 100% SN and 91% and 97% SP for IMI and MEM disks with 930 μg EDTA/disk, respectively and 96% and 91% for MBL E-test (10). Our results were in contrary with the mentioned studies. Our results showed that the DOR disk with 750 μg EDTA had the highest specificity yet the other tests did not show a reasonable percentage for specificity. Several factors contribute to these differences such as: the difference between various regions strains, the type of materials and antibiotics, the amount of EDTA/ disk and the errors made by the person performing the tests. However, we recommend using the CD test for detecting MBL-producing P. aeruginosa, since this test is simple to perform, can be easily introduced into the workflow of a clinical laboratory, and is less expensive than the MBL E-test. By PCR, we only detected one isolate harboring blaVIM and most of the positive isolates for MBL genes were blaIMP positive. In a previous study by Khosravi and Mihani performed on burn patients in Ahvaz, 8 (19.51%) isolates were positive for blaVIM genes, whereas none of the isolates were positive for blaIMP genes (3). Also,Bahar et al. (19) detected 23 (12.3%) blaVIM positive in burn patients, similar to the Khosravi and Mihani study (3), they did not find any blaIMP positive samples. These findings oppose our results. In another study by Yousefi et al. the results of PCR revealed that 18 (17.31%) and 6 (5.77%) imipenem non-susceptible isolates of P.aeruginosa carried blaVIM and blaIMP genes, respectively (23). Franco et al. reported MBL genes in 30% isolates, 81% of those were blaSPM positive and 19% were blaIMP positive (26). In our study, we did not find any blaSPM positive isolates. Jácome et al. detected 44.8% (13/29) MBL producers among 29 isolates resistant to imipenem and/or cefazidime by phenotypic evaluation, amongst which 46.2% (6/13) were positive for the blaSPM-1 gene (30). The blaIMP and blaVIM genes were not detected in our study. Also in the present study, we found an isolate that carried a blaIMP gene with different sequence. This isolate must be further evaluated for integron/plasmide structure. In summary, understanding and continuously monitoring the prevalence and resistance mechanisms of carbapenem-resistant P.aeruginosa enables us to formulate appropriate treatment strategies to fight against nosocomial infections. The authors appreciate and thank the Research Deputy and Vice-chancellor for research affairs of the Ahvaz Jundishapur University of Medical Sciences, particularly the Research Consultation Center (RCC) for their technical support and the Cellular and Molecular Research Centre for their financial support for this research and also the microbiology laboratory staff of Emam Khomeini, Golestan and Taleghani hospital for their great support. Authors’ contributions: Study concept and design: Soodabeh Rostami and Ahmad Farajzadeh Sheikh. Analysis and interpretation of data: Soodabeh Rostami, Saeed Shoja and Raheleh Sheikhi. Drafting of the manuscript: Soodabeh Rostami. Critical revision of the manuscript for important intellectual content: Farzin Khorvash and Mohammad Amin Tabatabaiefar. Statistical analysis: Azadeh Saki. Funding/Support: This study was supported by a grant (No CRMC-55) from Ahvaz Jundishapur University of Medical Sciences and Cellular and Molecular Research Center.